Music at Burgess Hill Girls is outstanding. Performances at every level, from school and community concerts to national competitions, bring much acclaim from audiences and adjudicators alike. We encourage and nurture every style and interest in music from traditional Western Classical through to contemporary popular styles and musical cultures from around the globe. Music is considered a universal language that has no boundaries and can be shared by everyone. 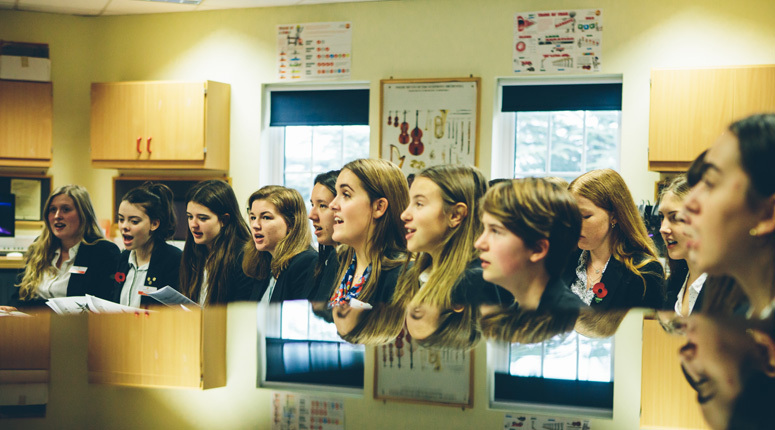 Students in Years 7 to 9 have one 40 minute music lesson each week with a specialist music teacher. The curriculum covers a broad range of music, from Western Classical to Contemporary Pop, taking in World genres and music for Media and Screen. Through these areas students develop creative and technical skills as well as cultural awareness. Music at GCSE is a development of the work studied at Key Stage 3 and a stepping stone for further study at AS and A Level. We study the Edexcel Syllabus and the course aims to develop students’ understanding and appreciation of a wide range of musical genres and styles and encourages critical and creative thinking. The course is divided into three components – performing, composing and listening – and has four Areas of Study: Western Classical Music 1600-1899; Music in the 20th Century; Popular music in context; World music. Key skills that are developed through this course include communication, creative use of technology, improving own learning and performance and working with others. We are proud that, historically, girls have consistently achieved excellent grades in this subject. Over 200 girls take instrumental lessons from our dedicated peripatetic teachers at the school, and we have a wide range of extra-curricular musical groups on offer including choirs, orchestras, a jazz band, and an African drumming group as well as a large range of string, woodwind and brass chamber ensembles to suit all abilities. Some girls even form their own ensembles in the form of bands and even a Glee Club. There are also opportunities to direct other musicians and learn the skills of conducting. Giving voice to your own musical ideas and learning how to craft and develop them is as important as learning an instrument, and our girls develop their skills of composition in a range of styles. One of the most special occasions we have is hearing a student’s work come to life at a concert. Come to one of our concerts… they are fantastic! Come and see the enthusiasm, passion and confidence. See the exceptionally high standard and hard work that has gone into it. See the fun and enjoyment we all get from music.